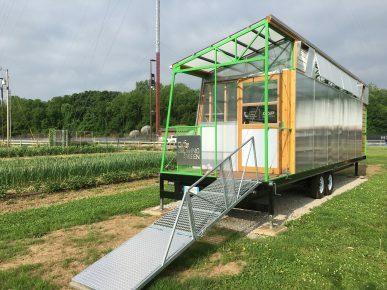 Butler University’s Center for Urban Ecology Farm is the new home of the first fully automated, mobile greenhouse, an 8-foot-wide by 32-foot-long structure designed and built by Ball State University architecture students to enable the CUE Farm to start plants earlier in the season. The $50,000 project was built with a grant from the Butler Innovation Fund. Public tours for the greenhouse will take place November 3 from 3:00–6:00 PM at the farm, which is located west of campus near the athletic fields. The event will occur during the last farm stand of the season. A week’s worth of produce will be offered as a raffle prize. The greenhouse was built to be mobile because the farm is in a floodplain, so a permanent structure was not an option. It will serve as a model for other urban farms, which often experience land access challenges that require mobility. Ryan said when the decision was made to create a mobile greenhouse, Butler representatives approached Timothy Gray, Associate Professor of Architecture at Ball State. Gray and his students previously designed and built the CUE Farm’s mobile classroom, which is made from a shipping container. Over two semesters, his students designed and built the structure, taking into account variables such as placement on the farm to get the best sunlight and shelving to house the optimum number of plants. Their design also includes ventilation, heating and cooling, heat-sensitive actuators that open and close windows, fans connected to a thermostat, and an irrigation system customizable to different times of the year and different plants. Ryan said he is impressed with the students’ work. Gray said what his students designed and built is a prototype. There has already been interest from other communities that found the design at https://growinggreen2016.wordpress.com/. One of the calls he received was from Liverpool, England. The greenhouse is not only functional, but it caught the attention of the American Institute of Architects. Gray and his students won a prestigious 2016 American Institute of Architects Indiana Design Award for the mobile greenhouse.